The Visakhapatnam average altitude (elevation) 2 to 10 meters above sealevel. 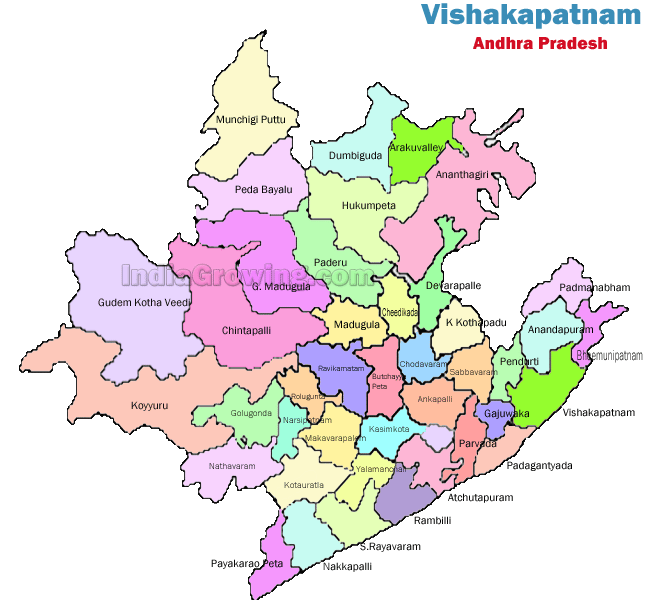 The Nearest Airport to Visakhapatnam is Visakhapatnam Airport.The Collectorate office for this district is District Collector Office, and other popular district head offices are AP Micro Irrigation Project District Office, District Fire Office, DISTRICT PANCHAYAT OFFICE,VISAKHAPATNAM, The District Cooperative Bank, District court, dpro office, The nearby Fire service for this district is Fire Station. The District Library is Government Library.The Head Post office for this district is in Visakhapatnam Post Office (Psk 2). and the Railway Station is Visakhapatnam (station). Water clogging around the residential colony due to construction of roads without drainage system leads to sevier helth problems due poisoness mosquitos,flys,insects and snakes...from last one month water was stagnated around the colony with depth of one meater,already complainted to excutive officr chodavarm but so far no action was taken due to this problem my wife and son had admitted in sevenhills hospital visakhapatnam with viral fever and jaundice...please resolve the issue before occuring noticeable incident..
Iam kshtriya raju. My family name is DODDIPALLI. COMES UNDER DHANANJEYA GOTRA.my fore fathers settled in tamilnadu. THERE ARE TWO DODDIPALLI ONE IS IN CHITOOR DT, AND ANOTHER ONE IS IN VISHAGAPATNAM DT. CAN ANYONE CLEAR MY DOUBT? PLS. THERE IS A SITE AT VEPAGUNTA NEAR SAMPATH FURNITURE SHOW ROOM BELONGS TO SIMHACHALAM DEVASTHANAM. ONE OF THE PERSON IS GOING TO OCCUPY THAT LAND . SO PLEASE GO AND CHECK . IAM NOT GOING TO GIVE MY MAIL IT IS PROBLEM FOR ME WITH THAT PERSON. sir, sanitation works cheyinchadam ledu. panchaythe lo vundeye dialy workers ne president thana own works ke use chasukuntu nadu. recent ga ma vuru nookalamma kalva dhagiira penta kuppa vunteye adhe panchyatee cheyinchindane bill pettaru. maa vuru main road from nh5 bagoledhu. neanu 2012 lo ichhina commet ku spandana vachhi ma village ki road vesaru. ippudu e village ki employment big problem graduate complete ayina varu unna vari ki job leaka inti daggara undi potunnaru daya unchhi ma gramaniki un employment leakunda cheastaeani officers ni korutunnanu. my village face to water problem. Roads are very poor and transportation is very poor in this road.